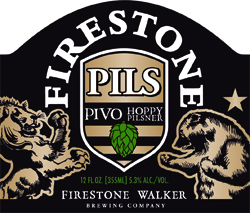 A gold medal winner at the 2013 Great American Beer Festival, Pivo Hoppy Pils is brewed with pilsner malt and hopped with German Magnum, Spalter Select and Saphir hops. Because it is so artfully skilled in the ales department, I was eager to see what Firestone Walker could do in the lager family. No surprise, this “hoppy pilsner” utilizes the best the brewery has to offer. It carries all the classic looks of the beer made famous in Pilsen, and the first whiff as the beer cascaded into a class was sweet grain and zesty hops. Where others have tried and fallen short, Pivo has excelled. Balanced and bursting with flavor, it’s the pilsner we’ve been looking for. It’s a beer for the people, even hop heads. Call a beer “Pivo” and it had better be credibly Czech in inspiration, which fortunately this very much is. Bright gold with a fragrantly floral aroma holding just a bit of sweetness. There is a bright and lovely balance of malt and hop in this lager—with nectar and flower honey in the former and drying, faintly perfumey bitterness in the latter. Bone dry on the finish, this is the kind of satisfying, quenching beer I crave at the end of a long and arduous day, hot weather or cold.